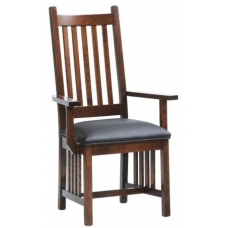 Our Mission Spindle Back Arm Chairs sit perfectly around our Trestle or Pedestal tables. No piece of furniture is harder to build than a chair. It takes more stress, torque and movement than any other item, so much so that many companies do not build thier own chairs. We do. Notice the Solid Oak one piece Back Legs, Spindles and Side Spindles. This is where our craftsmanship really shines.